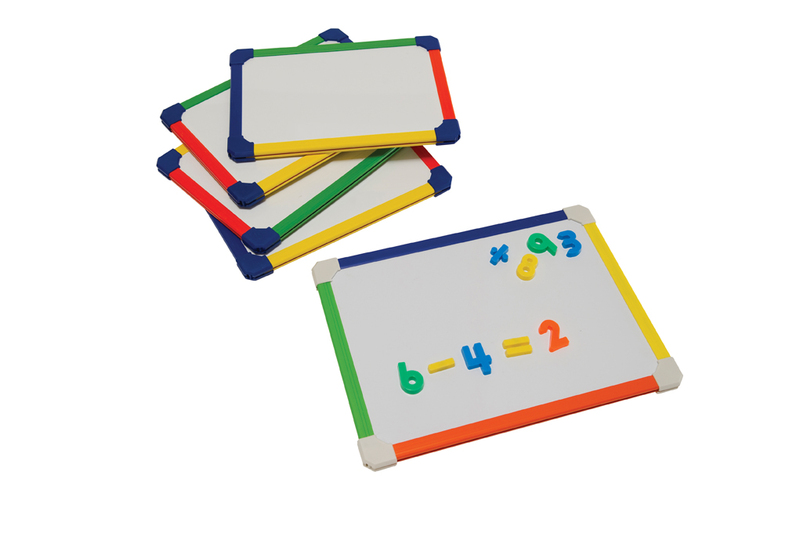 This pack of 10 sturdy rainbow framed drywipe lapboards is ideal for group work in schools. Lapboards are perfect for getting students involved with work in an interactive way. They can aid them with improving everything from handwriting and spelling to musical ability. These mini-whiteboards come in an A4 size, and can be stacked, making them easy to store away when not in use. These eco-friendly whiteboards help to reduce paper wastage and can be reused time and time again. Made from recycled material, the lapboards are environmentally friendly whilst being colourful and fun to use for students. Mini-whiteboards are a good way of encouraging children who are lacking in confidence to put forward more of their ideas. This is because the whiteboards are drywipe and easy-clean so work can be changed and wiped away for more than one attempt. Whiteboards can be used by teachers to assess students’ understanding during lessons, in a quick and effective way. The frame of the lapboards are manufactured from ABS plastic making them durable and able to withstand daily classroom usage. Lapboards are portable and ideal for use in different teaching environments and can be used in an outdoor environment. The handheld whiteboards are available with a magnetic or non-magnetic surface. Use the magnetic whiteboards with magnetic accessories for increased engagement or non-magnetic whiteboards for an alternative learning resource to pen and paper.